Once again, we turn our attention to the pages of the Old Testament and peer through our pair of New Testament binoculars in an attempt to see one of the most crystal clear Old Testament pictures of Christ; the life of Joseph. Let us approach his story with an open heart and open eyes as we filter it through the cross of Calvary. To begin with, one of the most obvious parallels is the fact that both men faced false accusations of crimes they never committed (Genesis 39:16-18, Matthew 26:59-60). And in the comparison of Joseph and Jesus, who could forget the climatic stories of deliverance. Joseph delivered the people of his day from a severe famine that struck the land by providing the grain needed to survive (Genesis 50:20). And Jesus, the Bread of Life, provides deliverance to every hungry soul that comes His grain bin to be spiritually filled (John 6:35). In this we see that Joseph saved the people from physical starvation (Genesis 50:20) while Jesus saved people from eternal damnation (Matthew 1:21, John 3:16). Yet still, mingled within all of these parallels is the overarching theme of forgiveness. Even though Joseph was falsely accused and blamed for something that he never did, and even though he had been completely abandoned, he still forgave his brothers for all they had done(Genesis 45:1-15). Likewise, our Lord Jesus showed forgiveness to those who had wronged Him by crying out, “Father forgive them, for they know not what they do” (Luke 23:34). But the snapshot of Christ found within the story of Joseph goes much further and deeper; for there are many reflections of the Savior often overlooked. For example, both Jesus and Joseph are described as shepherds. Joseph tended to his earthly father’s sheep (Genesis 37:2). Jesus is the good Shepherd who tends to His heavenly Father’s sheep (John 10:11). Also, they are both described in the Scriptures as being loved by their father (Genesis 37:3, Matthew 3:17). Yet even though they were both loved by their fathers, they were hated by their jealous siblings (Genesis 37:4, John 7:4-5). Both made a trip to Egypt within their lifetime (Genesis 37:26, Matthew 2:14-15). Both showed up on the public scene at the age of thirty (Genesis 41:46, Luke 3:23). Both Jesus and Joseph were hated by their enemies who desired to destroy them (Genesis 37:20, John 11:53). Both men were stripped of their clothing (Genesis 37:23, John 19:23-24) purchased for the price of a slave (Genesis 37:28, Matthew 26:15) and both felt the weight of prisoners chains (Genesis 39:20, Matthew 27:2). Both were specifically paired with two other prisoners in the Scriptures; one of which was lost and the other one being saved (Genesis 40:2-3; Luke 23:32). Do you see the shadow of our Savior in Joseph’s story? The similarities are overwhelming! As we leave this Old Testament snapshot of the Savior, we bring our thoughts to our passage above. In this frequently quoted verse we are reminded that Joseph’s siblings meant to bring evil upon their little brother. But despite their best efforts to bring about their wicked schemes, the Lord God meant it all for good. And so it is in the story of our Savior Jesus Christ; despite the best efforts of Jesus’ enemies, God meant the events of Calvary for good and for His glory. The Bible even says that it pleased the Lord to bruise Him (Isaiah 53:10). Thus, God meant it for good, and all because He loves the people of the world (John 3:16). My dear Christian friend; humbly lower the bucket of your soul and draw deep from the well of God’s Word; for it is a well that never runs dry (John 4:14). Ask God to give you the eyes to see the red river of Christ’s blood that flows throughout the pages of the Old Testament. Ponder these things today, and know that the entire Word of God has one sweeping story – the story of Jesus! I think it is cool how even though all that happened to Joseph and Jesus they still did not retaliate and try to get revenge on the people that wronged them but instead forgave them for everything they had done. 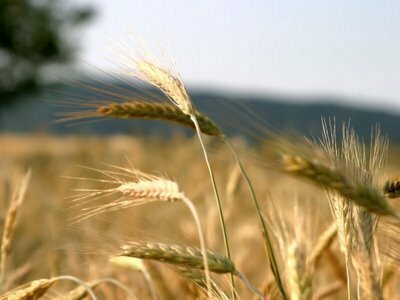 Just as Joseph gave grain to his brothers so also does God give us grain during times of spiritual famine for us. That’s very comforting because God will still forgive us when we humbly crawl back to Him. We should forgive the way Jesus and Joseph did with others. We should show our Christ likeness and forgiveness the way Jesus did for us. I never really noticed how Jesus and Joseph were alike until I read this passage. It is amazing how God uses other people in the Bible to give us glimpses of Jesus way before He was even born. If I was in Joseph’s position I wish I could say I would be as forgiving as he was. It’s amazing to me how you can see God shine through him. In my life I need to work on forgiveness and letting God be seen through me. This reminds me of the story of Job. Job went through so much suffering and lost everything but in the end he came out much stronger. Same as Joesph was sold into slavery then thrown into prison he came out much stronger and was able to save his brothers from the famine to come. The hardest thing for me to do is to forgive people who wronged me. It’s also not to hold grudges against the people who wronged me. I never really thought about Joseph and his story like that. I will go back and ponder his story. I need to learn how to forgive people. Also like the bible says if a man strikes you. Give him the other cheek. It is amazing how similar they are. I have bever noticed that before. I would love to be more forgiving as they were and are. Joseph lived his life in a way that reflected Jesus, especially in the aspect of forgiveness. I need to strive to live like Jesus in all aspects of my life also. Joseph is definitely a role model for being humble and forgiving. It’s always cool to see Old Testament parallels to Jesus and how others can guide us in our spiritual walk. It is amazing how Joseph never gave up. He was obedient and didn’t complain. I think we can all learn from this, whenever we are challenged. We should always just be obedient and not complain, because good things come to those that wait. Joseph and Jesus both give me examples of true forgiveness and love. Forgiving and loving are two of the toughest actions to perform especially when you feel people are undeserving of them. Jesus and Joseph both did this when others were most undeserving. I’ve never thought about the story of Joseph this way. Maybe because I heard it so many times as a kid, I never tried to look deeper into it. As Mrs. Sieg would say, It always comes back to the same story. I have never thought that there were parallels between Joseph and Jesus. It’s neat to see how there life are similular.